What a sorry life you lead, whether night or day! 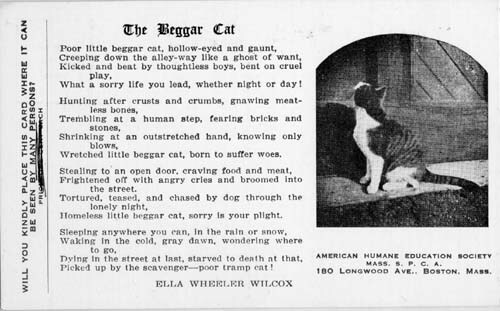 Wretched little beggar cat, born to suffer woes. Frightened off with angry cries and broomed into the street. Homeless little beggar cat, sorry is your plight. Picked up by the scavenger--poor tramp cat! From a postcard from the American Humane Education Society.